Street art like this pops up from time to time in Ottawa’s central areas, but, unfortunately, it is usually promptly removed. Vanity mirror near Bank Street, now replaced with “For Sale” sign. This entry was written by Nick Wellington , posted on Thursday November 23 2006at 10:11 pm , filed under Art and Design, Canada and tagged Ottawa, Street Art . Bookmark the permalink . Post a comment below or leave a trackback: Trackback URL. I’m surprised those were taken down so quickly. The telephone pole one I can maybe understand, but the vanity mirror seems pretty unobtrusive. Good thing you captured them on film! Or, uh, in pixels. 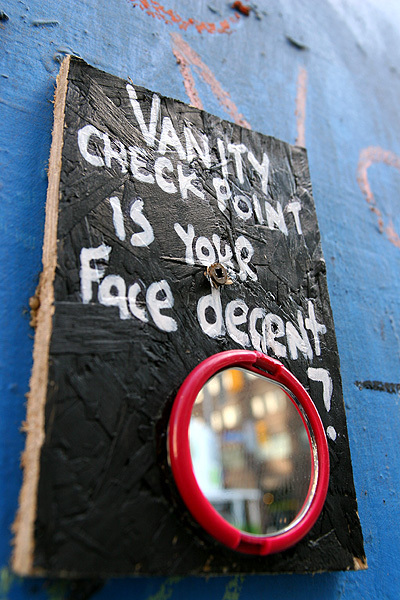 It’s a shame, but to be fair, the vanity mirror was taken down for private advertising, not by the city. 10/10 for the vanity check point. Too bad about the vanity check point. I thought it was actually pretty clever, and useful, too. These are really cool.. hope the creater puts some more around the city.. it would be nice to stumble upon it.